Apple is the dream company we always wished for when we were children. The messiah of companies that we never thought would come to Earth in our lifetimes. When I was a kid the only thing I wanted in life was an Apple II+ . When I finally got one (my dad took one from his work and gave it to me for about six months) I did everything a young boy does with his computer. I programmed (in BASIC) the computer to type my name over and over again. I then went to the local computer store and shoplifted Ultima III. My friends and I then copied each others games so we had a whole set of games to play with. I then skipped school incessantly in order to play games all day, my friends and all calling each other throughout the day (we all skipped school every day) in order to share the latest secrets we found while hacking our way through Castle Wolfenstein. 15 years later Apple was on the verge of bankruptcy. 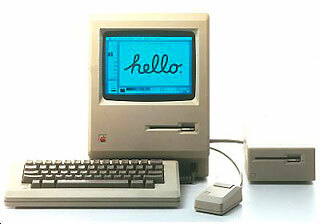 The company I worked for (HBO) and Philip Morris, the cigarette company, were the only two companies in the city that I knew of that used primarily Macintoshes (except for the legal department, which used all PCs and every document was redlined, outlined, greenlit, in WordPerfect 7.1.1). Gil Amelio, the CEO of the company for about 3 seconds came to visit HBO. We were all so impressed with him. The CEO of Apple! How much cooler could you get? At the time they were about thisclose from bankruptcy or being, at the very least, hopelessly inconsequential. Five years before that was the Apple Newton. The head of Carnegie Mellon’s Art school said to me, “this will change the world.” And five years before that, I wrote my first term paper on this amazing little device, the Mac 512k. I also saw Steve Jobs when he visited Cornell’s Computer Science Department to get them to buy some NEXT machines. They were beautiful. Maybe still the most beautiful desktop machines I’ve ever seem. Black cubes, super powerful. They were magic to program and experiment with. I wrote a chess program on them. Everyone surrounded Steve Jobs just to see what he looked like. I was jealous. He was young, rich, and had so much charisma you couldn’t even see past the light that shined out of him. Now, I’m writing this one my last Windows-based laptop ever. I know whats going to happen. Already in my house there’s one Macbook Air. There are two itouches, one iphone, 2 ipads, and 4 or 5 ipods. I’ve got 10 authorized computers already for itunes across two accounts. I download apps at least once per day, much more if you add in songs and tv shows and movies from the itunes store. Within two weeks, before I leave on a trip for India, I will buy a Macbook Air 13” to travel with and I know I will never go back to the HP laptops I’ve been using for almost the past 10 years. Now lets look at the basic numbers.